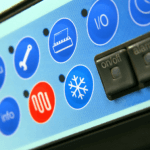 Home » All Posts » How Does a Zoned Heating/Cooling System Work? Maximizing the comfort of your home is our job. One of the ways we can help you achieve this goal is through a zoned heating and cooling system. What is a zoned system? A zoned heating and cooling system breaks your home into different areas or “zones”, each controlled separately by a thermostat. Zoning your home allows for several benefits including elimination of hot and cold spots and individual control of different rooms’ temperatures. The secret to a zoned heating and cooling system is electronically controlled dampers in your ductwork. Dampers are like valves that control the flow of your heated and cooled air throughout your home. 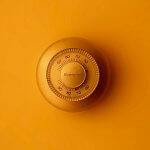 The second part of a zoned heating and cooling system is the thermostat. A thermostat is placed in each zone so that it can control the electronic dampers in your air ducts. When an area needs more air from your heater or air conditioner, the thermostat tells the damper to open up and let more air through. Likewise when an area has reached its desired temperature, it closes the dampers and sends the air to the rest of your home. Why would I want a zoned system? The most common use of a zoned system is to eliminate hot and cold spots. For example, most two-story or multi-level homes suffer from uneven heating and cooling. Because heat rises, the upper levels are always warmer than the lower levels. To combat this, at least two zones are installed – one upstairs and one downstairs. As one zone reaches the desired temperature, the thermostat slows the flow of air to that zone, which forces more air to the other zone and creates more even temperatures throughout your home. Another common use of a zoned home heating and cooling system is to meet the temperature demands of different family members without fighting over the thermostat. A zoned system lets you control the temperature of each area independently. If someone in your home likes it much colder or warmer than the rest of the household, this can be an ideal solution. 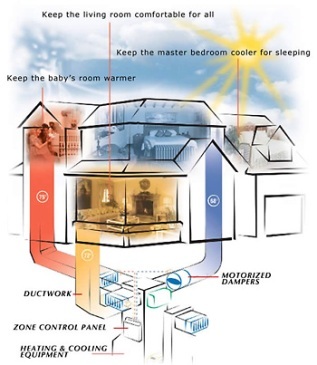 A zone is installed in their bedroom, letting them change their temperature without affecting the rest of your home. 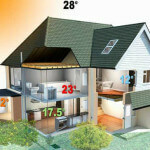 Zoning your home heating and cooling system can provide a multitude of benefits. For more information, ask our expert! Service Champions North is dedicated to providing the best home heating, cooling and air quality services to the residents of the East Bay, San Jose and Sacramento areas.